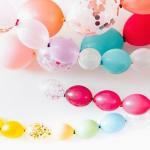 Can someone tell me the number of balloons to use for each balloon row to create a bowling pin? Thanks. 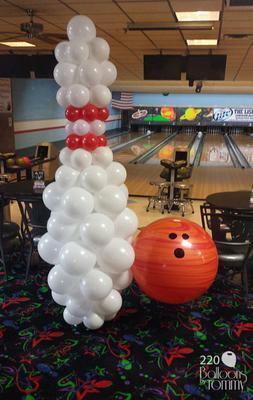 You are talking about a bowling pin sculpture made out of round latex balloons, right? When you do an image search for "bowling pin balloon" at Google or Bing, you'll see examples made with 4 to 6 balloons per row. I've uploaded one above. I think the ones with 5 or 6 balloons look nicer than the sculptures who use only 4 balloons per row. All of them use balloons of different sizes to form the bowling pin shape nicely. You had asked for sizes and supplies list. Well, I haven't done this sculpture myself, nor could I find a video or other instructions. 2 rows of red balloons; each row most likely consisting of 5 balloons. Balloon sizes seem to be either 9 inch or 5 inch, but inflated to different sizes. The balloon at the very top looks like an 11 inch balloon. 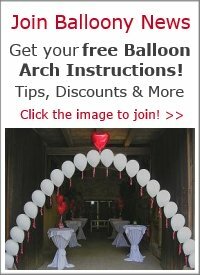 This should give you an idea about how many balloons you need and in which size. 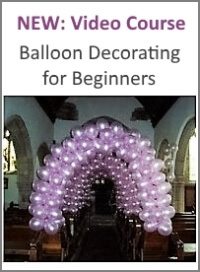 Then you'll also need a balloon base and stand. 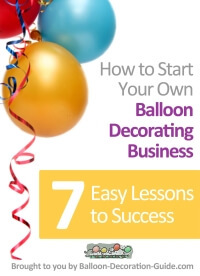 We have instructions how to make a balloon column stand here.